Wine people are invariably my people. My friends and family like to drink it, know how to cook with it, and don’t feel weird talking about it at length (is anyone else getting movie theater popcorn butter on the finish?) My husband, on the other hand, isn’t one of the club. He loves beer—Firestone Walker Double Barrel Ale to be exact. And I love him just the way he is. Still, I am forever shoving my wine glass under his nose and passionately insisting he take a sip. 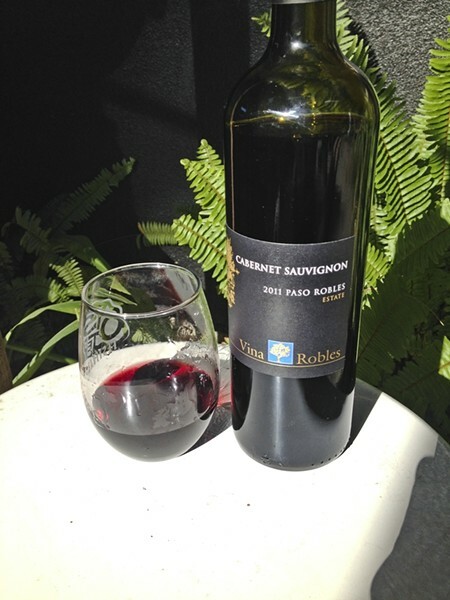 His answer, designed to drive me bonkers, is always: “Tastes like wine!” The other night, my hands covered in raw chicken goop, I asked my husband to take a break from the World Cup and pop open a bottle of 2011 Vina Robles cabernet sauvignon. He dutifully poured me a glass and, to my surprise, took a self-motivated sip. The response? “Wow. That is some really good wine.” Yes, mini pigs can fly. I inspected the bright, crimson color and swished a mouthful all the way up to my gums. I gurgled, played with it on my tongue, and slowly sucked it down. Oh yes. This is really good wine. With a velvety smooth mouth feel and darkly enticing tobacco aroma, this baby has “it” factor written all over it. There may be a good reason for that, too: Paso Robles experienced an atypical growing season in 2011, with mild overall weather, late harvest, small berry clusters, and light overall crop load. In laymen’s terms? What fruit did develop featured higher flavor concentration and a bit more “wow.” This medium-bodied, lusty estate cabernet sauvignon has plenty of charisma to carry your next dinner party lull. Better yet: Know a poor, wine-ambivalent soul? Set them up with a bottle of this and watch the sparks fly. $24 per bottle; Vina Robles Hospitality Center, 3700 Mill Road in Paso Robles. Note: The tasting room closes at 5 p.m. on Vina Robles Ampitheater show days, unless otherwise noted online. It literally takes all of my strength to enter Nautical Bean and not order their sinful turkey club wrap, accompanied by cream cheese, cheddar cheese, ranch dressing (I know, I know! ), avocado, and bacon. Sadly, the sprouts and lettuce do not cancel out all of that delicious, conspicuous fat. So, what do I do when faced with this dilemma? I order one of their equally addictive caffeinated concoctions and get out of there while I still have the will power to just say no. Nautical Bean’s popular Rainforest chai mate latte never fails to bring up my buzz as well as my attitude. It’s basically a fresh, strong yerba mate tea concoction topped with foamy soy milk goodness. Did I mention it has the allure of a decadent, sweetly-spiced chai dessert? Be warned: The seats at this packed coffee hub are usually taken up by laptop-toting students. Really, I don’t mind at all. It’s nice to kick back on their patio, where I can close my eyes and imagine the hum of traffic from Los Osos Valley Road is actually the swish of tall, rainforest ferns. Also, the smell of their thick-cut bacon is a little less maddening out here. About $4 for a medium; Nautical Bean, 11560 Los Osos Valley Road in San Luis Obispo. Send edible news and announcements to Hayley Thomas at hthomas@newtimesslo.com.